Sleeping becomes a new experience with float. Made of genuine solid wood, its unique lightness fascinates even when combined with high mattresses. 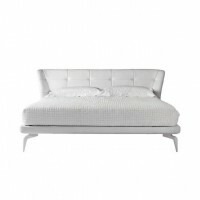 The new bed owes this appearance of floating and lightness to its elegant bed frame. A sophisticated design element is the fine groove that separates the bed sides in the centre and makes the frame seem even more delicate. When combined with high mattresses, the float bed offers a typical appearance for box spring beds with a high sitting edge. The height of the headboards – optionally in solid wood, fabric, leather or natural leather – still makes them very visible, preserving the elegant appearance of the bed.